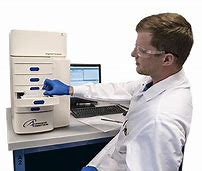 The Fragment Analyzer is a parallel capillary electrophoresis instrument designed to eliminate laboratory bottlenecks caused by slow and unreliable QC analysis of nucleic acids. These bottlenecks are resolved by the automation of key steps such as gel loading and sample injection. After separations are complete, nucleic acid fragment analysis is simplified with PROSize® Data Analysis Software. Together, the Fragment Analyzer and PROSize offer researchers the ability to quickly and reliably QC their samples and move on to downstream applications sooner.